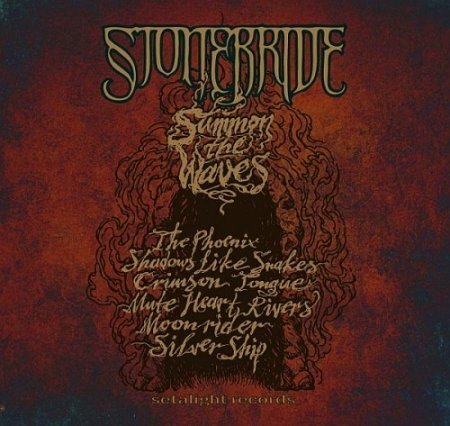 Stonebride - "Summon the Waves"
Berlin band Stonebride are back with their first full length CD. Some of you might have heard their Inner Seasons CD as well. Six long spacey tracks that mix the stoner grooves of Colour Haze and some dark heavy melodic riffs that remind me of Alice in Chains, Danzig and some total space out stuff as well. The opening instrumental track, The Phoenix, sets the tone, HEAVY. Shadows Like Snakes sound a lot like Alice in Chains. It later gets a bit doomier but all just riffs, no solos until the very end, but the song does evolve a lot over the long track and even sounds a bit like Colour Haze for a minute. Crimson Tongue starts pretty doomy but evolves into a rocking stoner tune. Mute Heart Rivers starts with drums and slowly the rest of the band enters into the tune. It stays pretty laid back for awhile before building up again. Moonrider starts a little spacey as it should with this title and at over 9 minutes takes you on a little journey. Silver Ship is a very long track and even sounds a bit like Danzig. This was a hell of a monster space out track with a killer uptempo ending and even a short organ solo and a great way to finish this record. A pretty damn cool album these guys have made. Glad to see people really experimenting in the stoner rock vein to broaden the horizon of the scene and music.